BOCAUE – It’s not as filled as it was when the PBA first played here two years ago, but there’s still a big enough crowd for the Philippine Cup Christmas Day offering at the Philippine Arena on Sunday. As per initial estimate, around 10,000 people are already on hand for the first game pitting Blackwater and Mahindra, with the numbers expected to further rise by the time the featured match between Barangay Ginebra and Star is played. 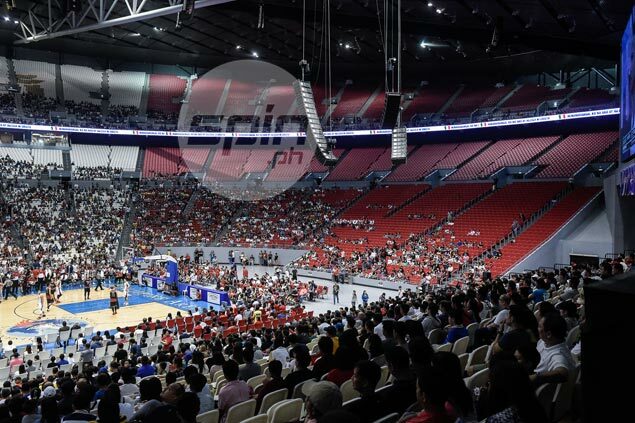 Asked for a statement on the number of live attendance, media bureau chief Willie Marcial admitted the day's box-office numbers may not be able to replicate the record crowd of 52,612 during the 2014 season opener that also featured a Ginebra game against TnT Katropa. The mark still remains as the biggest live attendance in the 41-year history of the league. Marcial said the Iglesia Ni Cristo, which owns trhe 55,000-seater indoor arena considered the largest in the world, has committed to fill the general admission section of the venue, which numbers to 25,000. “Sa kanila committed yun,” he said. So not counting the Iglesia numbers, the league expects to draw in at the most, a crowd of 15,000. Although final figures won't be released until after a few days, league officials estimated the attendance between 20,000 to 21,000. Last year, a crowd of 22,000 was on hand at the Mall of Asia Arena for the Philippine Cup playoffs game between the Kings and the Hotshots. Ginebra eliminated Star on a buzzer-beating three-pointer by LA Tenorio in overtime, 92-89.